The ETHERPATH is a LAN to Serial Device Server for Ethernet to serial applications. The Device features full serial handshake signals and 10/100BaseT network interface. This unit makes it easy to network enable any device that has a serial port. 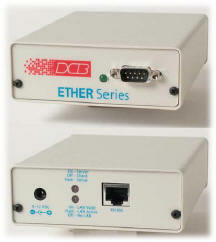 It's an economical async "Ethernet modem"
The EtherPath is a versatile single port serial server for Ethernet LAN/WAN's. It allows a "remote" serial port for any LAN connected workstation via telnet or port-redirector software. The EtherPath also connects any two async serial devices through a LAN, even via routers, when used in client-server or EtherModem mode. The EtherPath is often used with serial devices such as remote data collection terminals, DCB multiplexers and Access Switches, SCADA, building automation equipment, UPS's, bar code scanners, or climate control devices. It is used to connect serial management ports directly to an Ethernet network for "in-band" control of "out-of-band" devices. For this application, simply telnet to the serial management port of the connected device or use inexpensive (or free) port redirector software. The EtherPath uses the TCP/IP protocol, allowing data connection across routed or switched LAN/WAN networks as well as connections on a local network. The EtherPath supports serial interface speeds up to 230 Kbps. The EtherPath can automatically open connections when it powers up (Nailed-Up mode), eliminating the need for a manual request. Full flow controls (RTS/CTS) and Xon/Xoff are also supported. The EtherModem mode allows a serial device to treat the Etherpath as if it was a true "Ethernet Modem", using normal modem control and response strings such as "ATD", "ATE", +++, etc. This allows a single EtherPath to connect to multiple remote servers (either EtherPaths or telnet servers) under control of the attached serial device. Reverse Telnet (Telnet Client) mode allows telnet functionality to be added to serial devices. If in point to point client server mode and the "nailed" connection is lost, the EtherPath automatically reconnect when a path again becomes available. The EtherPath can be managed directly through its physical port as well as remotely from other network locations. Remote configuration is supported using TCP/IP (telnet) or with the easy web browser interface. Security lists are provided for management security. Telnet to the EtherPath or use COM: port redirector software on UNIX (SCO, FreeBSD, AIX, LINUX) or Windows machines, making the EtherPath a remote serial port for a PC or a work station. The EtherPath is an ideal remote access device for maintaining and controlling remote devices with RS-232 serial control ports. When used with the DCB Access Switch, the single serial port can be expanded to 152 ports including remote AC power control. DCB recommends Serial/IP port redirector for Windows machines. It's produced by Tactical Software and a 30 day demo can be downloaded from this link. After you've tried it, you can purchase the permanent license authorization from us for 86.00 $US. OEM manufacturers can design the EtherPath into their products or use it as an add-on method to gain ethernet connectivity.. DCB supplies the EtherPath to many other companies and can provide custom firmware for specific applications. NewEtherPath Redirect® server-locked version includes Serial/IP® redirector software!